Nginx web server, which is a fast-growing popular web server mainly used for serving HTML content, but it can also provide load-balancing, high-availability or reverse-proxy for a web server or for other network services. Mariadb\MySQL RDBMS which is where the data is stored in backed, while the dynamic processing is handled by PHP. In this tutorial, we’ll install and use MariaDB relational database management system, a community fork of MySQL, in favor of MySQL database, which is now owned and developed by Oracle. A minimal installation of FreeBSD 11.x. A static IP Address configured for a network interface. A regular account configured with root privileges or direct access to the system via root account. Preferably, a publicly registered domain name configured with the minimal DNS records (A and CNAME records). In the first step, we’ll install the MariaDB database system, which is the FEMP component that will be used for storing and managing the dynamic data of the website. MariaDB/MySQL is one of the most used open source relational databases in the world in conjunction with Nginx or Apache web server. Both servers are highly utilized for creating and developing complex web applications or dynamic websites. 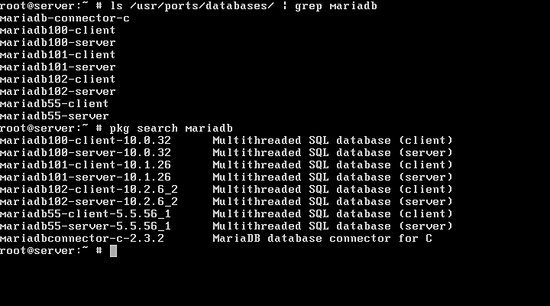 MariaDB can be installed in FreeBSD directly from the binaries provided by PORTS repositories. However, a simple search using ls command in FreeBSD Ports databases section reveals multiple versions of MariaDB, as shown in the following command output. Also, running Package Manager pkg command displays the same results. In this guide, we’ll install the latest release of the MariaDB database and client by using the pkg command as illustrated in the below excerpt. After MariaDB has finish installing in the system, issue the following command in order to enable the MySQL server system-wide. Also, make sure you start MariaDB daemon as shown below. 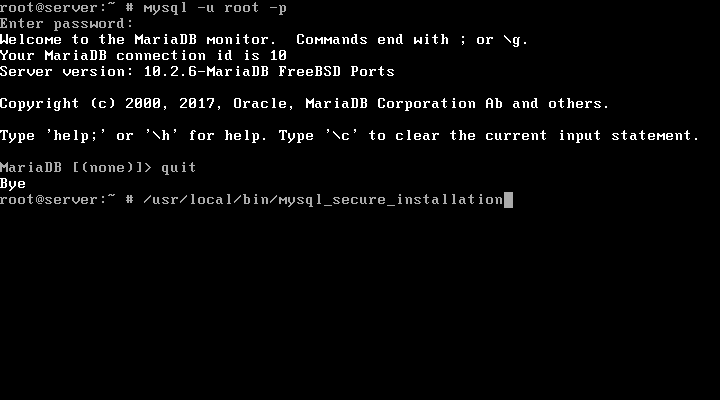 Next, we’ll need to secure MariaDB database by running mysql_secure_installation script. While running the script, a series of questions we’ll be asked. These questions purpose is to provide a level of security for MySQL engine, such as set up a root password for MySQL root user, remove the anonymous user, disable remote login for root user and delete the test database. After choosing a strong password for the MySQL root user, answer with yes on all questions, as illustrated in the below sample of the script. Do not confuse the MariaDB database root user with the system root user. Although these accounts have the same name, root, they are not equivalent and are used for different purposes, one for system administration and the other for database administration. Finally, after you’ve finished securing MariaDB database, test if you are allowed to perform local login to the database from root account by running the following command. Once connected to the database prompt, just type quit or exit in order to leave the database console and return to system user console prompt as shown in the below screenshot. Running sockstat command in FreeBSD quickly reveals the fact that MariaDB is opened to external network connections and can be remotely accessed from any network via 3306/TCP port. In order to completely disable remote network connections to MariaDB, you need to force mysql network socket to bind to the loopback interface only by adding the following line to /etc/rc.conf file with the below command. Afterwards, restart MariaDB daemon to apply the changes and execute sockstat command again to display the network socket for mysql service. This time, MariaDB service should listen for network connections on localhost:3306 socket only. If you are developing a remote web application that needs access to the database on this machine, revert MySQL socket changes made so far by removing or commenting the line mysql_args="--bind-address=127.0.0.1" from /etc/rc.conf file and restarting the database to reflect changes. In this case, you should take into consideration other alternatives to limit or disallow remote access to MySQL, such as running a firewall locally and filter the IP addresses of clients who need remote login or create MySQL users with the proper IP addresses grants to login to the server. The next important daemon that we’ll install in FreeBSD for our FEMP stack is the web server, represented by Nginx service. 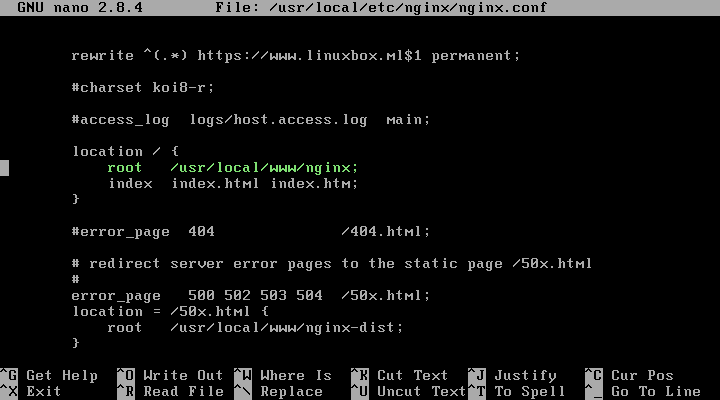 The process of installing Nginx web server in FreeBSD is pretty straightforward. Nginx web server can be installed from the binaries provided by FreeBSD 11.x Ports. 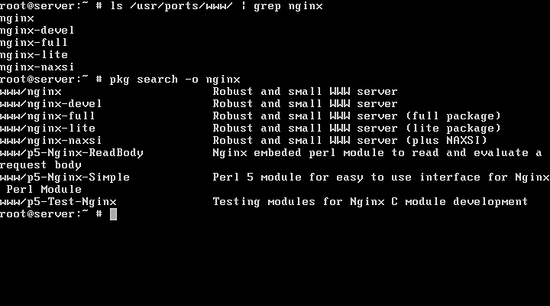 A simple search through Ports repositories in the www section can show a list of what pre-compiled versions are available for Nginx software, as shown in the below command excerpt. Issuing the package management command can display the same results as shown in the below image. 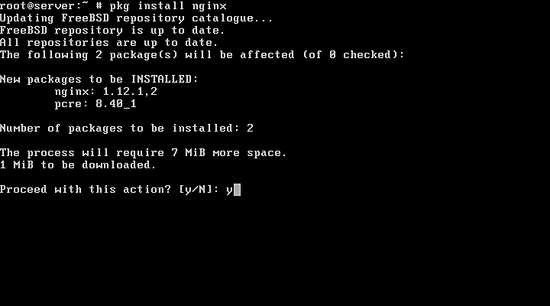 In order to install the most common version of Nginx in FreeBSD, run the below command. 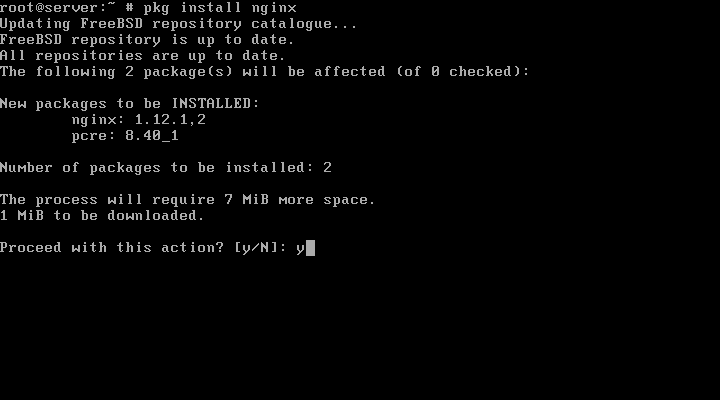 While installing the binary package, the package manager will ask you if you agree with downloading and installing Nginx package. Usually, you should type the word yes or y in the prompt in order to start the installation process. 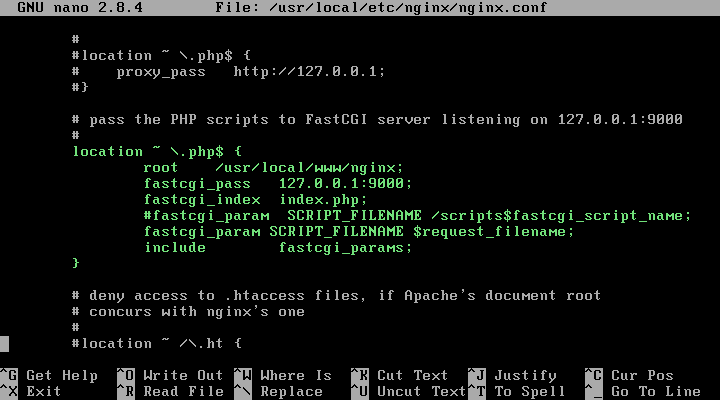 To avoid the prompt add the –y flag while issuing the command: pkg –y install nginx. After Nginx web server software has been installed on your system, you should enable and run the service by issuing the below commands. You can execute sockstat command in order to check if Nginx service is started on your system and on what network sockets it binds on. 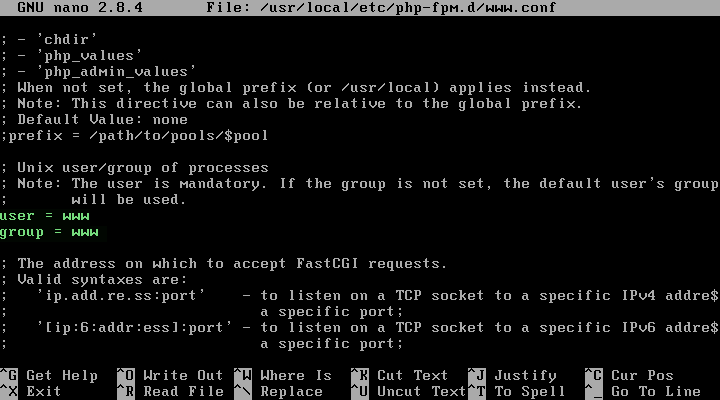 Normally, it should bind by default on *:80 TCP socket. 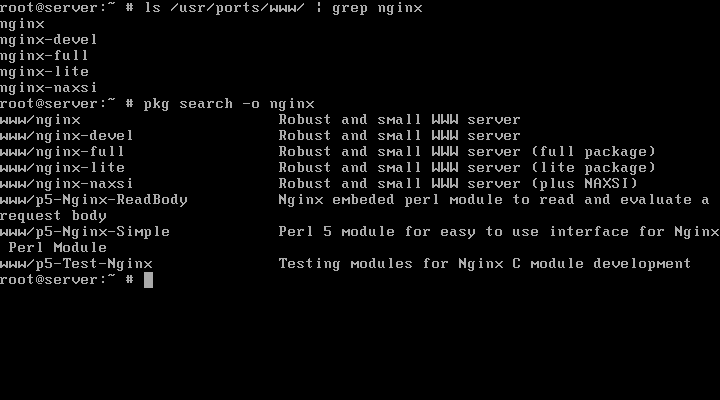 You can use the grep command line filter to display only the sockets that match nginx server. In order to visit Nginx default web page, open a browser on a computer in your network and navigate to the IP address of your server via HTTP protocol. In case you’ve registered a domain name or you use a local DNS server at your premises, you can write the fully qualified domain name of your machine or the domain name in browser’s URI filed. 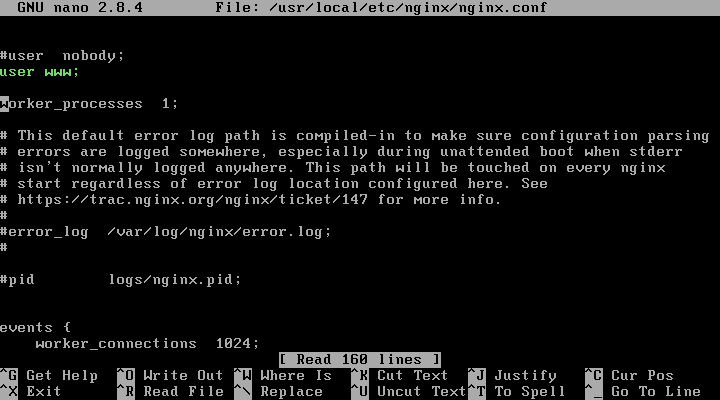 A title message saying "Welcome to nginx!" alongside a few HTML lines should be displayed in your browser, as shown in the following screenshot. The location where web files are stored for Nginx in FreeBSD 11.x is /usr/local/www/nginx/ directory. 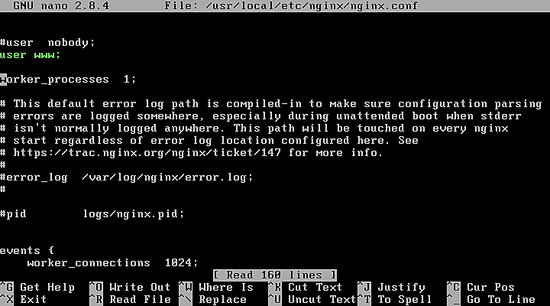 This directory is a symbolic link to the nginx-dist directory. 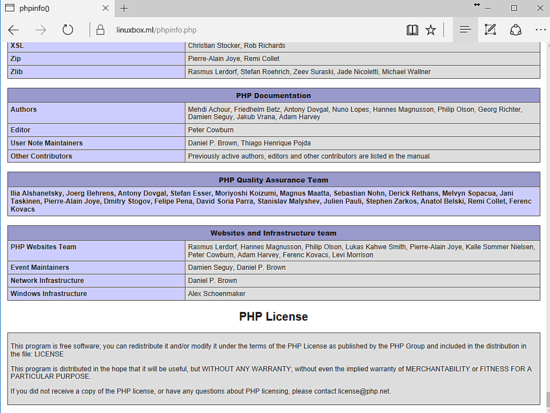 To deploy a website, copy the html or php script files into this directory. 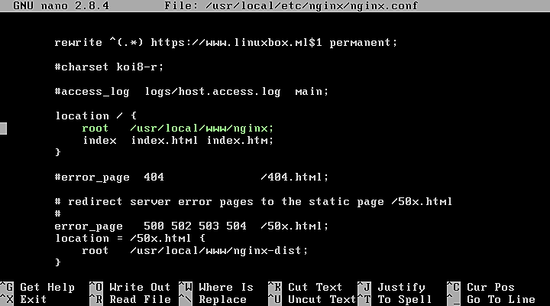 In order to change Nginx default webroot directory, open Nginx configuration file from /usr/local/etc/nginx/ directory and update root statement line as shown in the below example. 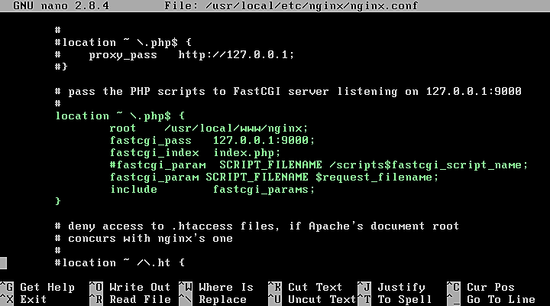 By default, Nginx web server cannot directly parse PHP scripts, Nginx needs to pass the PHP code trough the FastCGI gateway to the PHP-FPM daemon, which interprets and executes the PHP scripts. In order to install the PHP-FPM daemon in FreeBSD, search for available PHP pre-compiled binary packages by issuing the below commands. From the multitude of PHP versions available in FreeBSD Ports repositories, choose to install the latest version of PHP interpreter, currently PHP 7.1 release, by issuing the following command. If you're planning to build a website based on a content management system, review the CMS documentation in order to find out the requirements for your system, especially what PHP modules or extensions are needed. Because we are running a database server in our setup, we should also install the PHP database driver extension, which is used by PHP interpreter to connect to MariaDB database. Next, update the PHP-FPM user and group to match the Nginx runtime user by editing PHP-FPM configuration file. Change the user and group lines variables to www as shown in the below excerpt. Change the following lines to look as below. 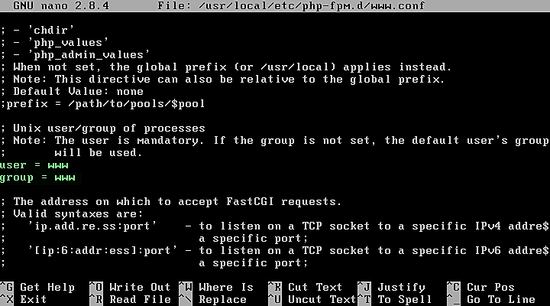 By default, PHP-FPM daemon in FreeBSD opens a network socket on localhost:9000 TCP port in listening state. To display this socket you can use sockstat command as shown in the below example. 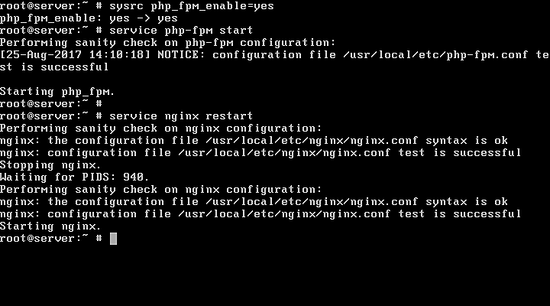 In order for Nginx web server to exchange PHP scripts with PHP FastCGI gateway on 127.0.0.1:9000 network socket, open Nginx configuration file and update the PHP-FPM block as shown in the below sample. After you’ve made all the above changes, create a configuration file for PHP based on the default production file by issuing the following command. You can change the PHP runtime settings by editing the variables present in php.ini file. Finally, in order to apply all changes made so far, enable the PHP-FPM daemon system-wide and restart PHP-FPM and Nginx services by issuing the below commands. In order to get the current PHP information available for your FEMP stack in FreeBSD, create a phpinfo.php file in your server document root directory by issuing the following command. Then, open a browser and navigate to the phpinfo.php page by visiting your server's domain name or public IP address followed /phpinfo.php file, as illustrated in the below screenshot. That’s all! You’ve successfully installed and configured FEMP stack in FreeBSD 11. The environment is now ready and fully functional to start deploying dynamic web applications at your premises.